Optimized for medical necessity and reimbursement understanding, this all-in-one resource focuses on the most important CPT and HCPCS codes for cardiology and vascular surgery, plus medicine and ancillary services codes chosen by experts who have taken into consideration utilization, denial risk and complexity. 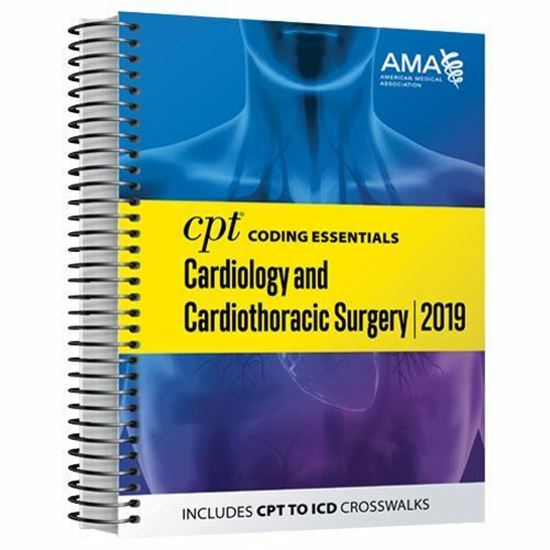 CPT® Coding Essentials optimizes both CPT and ICD-10 code selection with helpful CPT-to-ICD-10-CM crosswalks and detailed explanations of anatomy, physiology and documentation. Other than the AMA CPT® Professional Edition codebook, this is the only book in the market with verbatim CPT-panel–approved guidelines and parenthetical information specific to cardiology and vascular surgery. This is the ideal daily companion featuring useful, definitive specialty-specific coding information beyond what is provided in a full procedural codebook. Cardiology and vascular coding and billing knowledge that otherwise might take years of experience or multiple resources to accumulate is available in a single volume.